For 500 years the most prominent landmarks in Korbach in north-western Germany were the belfries of the two 15th-century churches. By the end of the 19th century, however, Korbach was a very different place, and a very important one in the realm of tyre manufacturing. The coming of the railways brought industry and the establishment of a rubber factory in the town. This meant the construction of the huge cooling chimney that still dominates the skyline, towering over you as you walk down Continentalstraße through the factory gates. 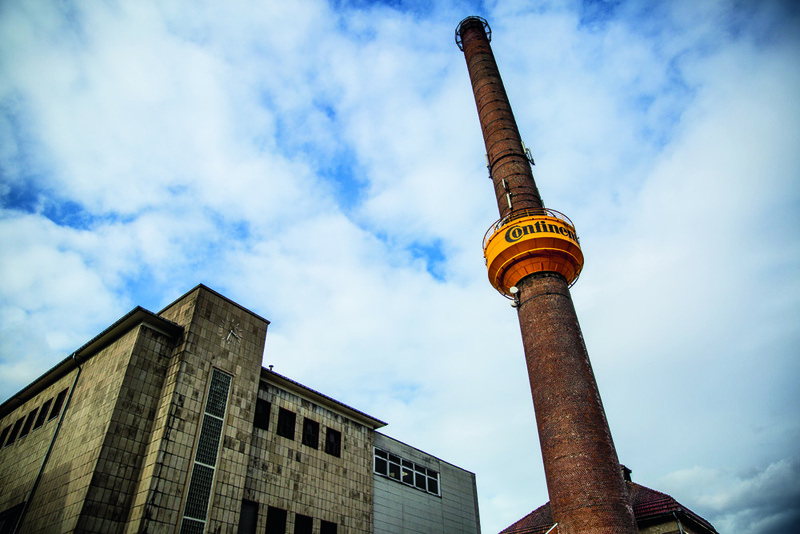 The great chimney may no longer belch out fumes, but the factory still bustles with life as we arrive along with a few of the plant’s 3,500 workers (15 per cent of the town’s population) for the Wednesday morning shift. In an age when almost every part of most bikes is made in the Far East, Continental is understandably keen to emphasise its German heritage. However, this pride seems to be a relatively new part of the its mentality, stemming as much from a need for financial stability as from an innate patriotism. Back in 2005, Continental was close to losing a vital part of this heritage. 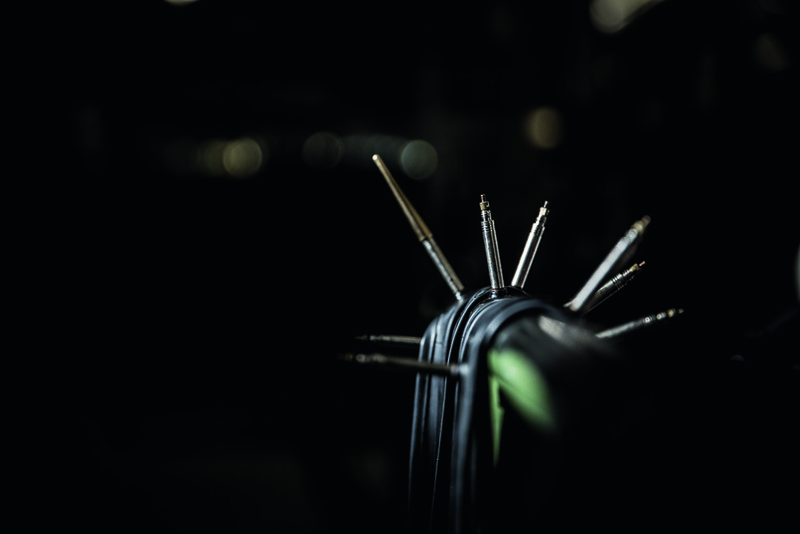 The Korbach factory was on the point of closure as the board looked to move all cycling tyre production to China and India in an attempt to protect profits. That was until Jörg Malcherek, the marketing director of the cycling division, wandered past an Audi advert in Birmingham airport: “Vorsprung durch technik.” Suitably inspired, Malcherek decided to riff on this theme of reliable, efficient and typically Germanic products, coming up with the Deutsche Technik (‘German Technology’) slogan that now adorns all Continental tyres. The success of this strategy has seen the Korbach factory go from strength to strength. 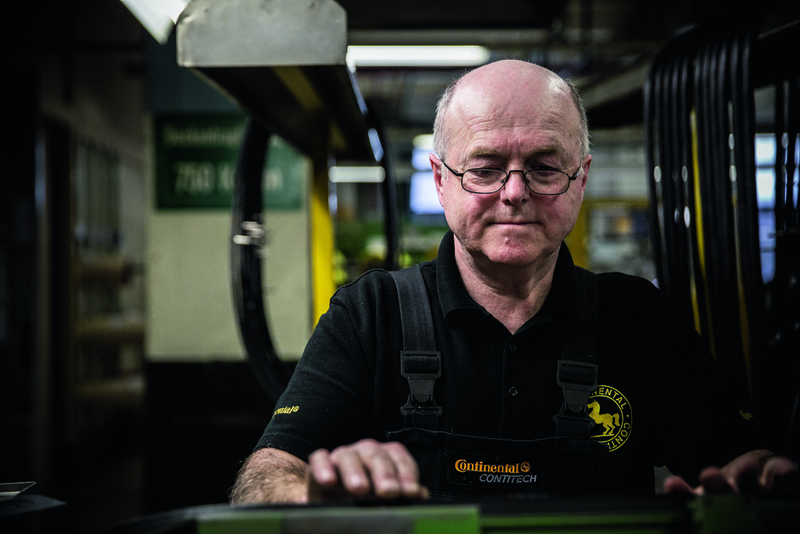 Apart from on Christmas Day and New Year’s Day, production runs 24 hours per day, seven days per week, with Building Number One, the home of the bicycle division, churning out an astonishing six million tyres every year. All of the company’s premium road tyres are produced in the Korbach factory, including the legendary Grand Prix and Gatorskin lines. Only the lower-end Grand Sport and Super Sport tyres are produced in Hefei, China, using identical machinery and processes. So what exactly goes into the process of getting a tyre off the drawing board and on to your wheels? The first step is the rigorous testing process through which all tyres must pass before Continental is willing to put them into production. The first test sees the tyre run against a drum at 50kph continuously for an entire week — the equivalent of 7,000km — also receiving three shocks from various angles with every rotation, the perfect simulation for your average British road surface. Second, Continental tests how the tyre interacts with the rim. The rim is lubricated with silicone and the tyre pumped up to twice its maximum pressure (something in the region of 240psi/16.4 bar) to check that it will never pop off the rim in real-world use. The final two tests are designed to make sure the tyres meet Continental’s expectations in terms of performance as well as safety. Again running on a drum, the tyres are subjected to numerous accelerations and decelerations, with measurements taken of the energy needed to stop the tyre and bring it back up to speed, giving a good indication of rolling resistance. Finally, the most brutal test is the puncture-protection test, where each tyre is subjected to mechanical abuse by two pieces of metal shaped like a thorn and a knife to check that the rubber is able to keep up Continental’s reputation for producing some of the most robust hoops on the market. >>> Will cycling see the return of the solid tyre? Once a new tyre design has passed these tests, it is ready to hit the production line. 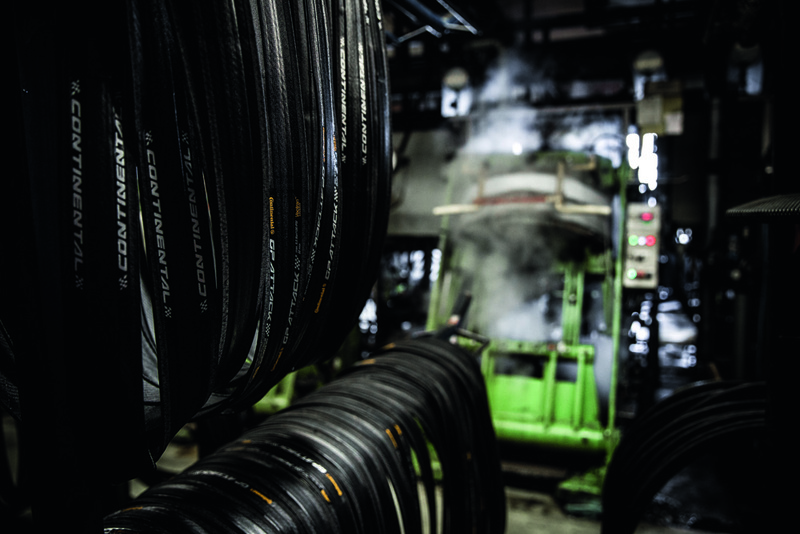 The Korbach factory is fully equipped to see the creation of each tyre through from start to finish, beginning, of course, with the production of the rubber itself. 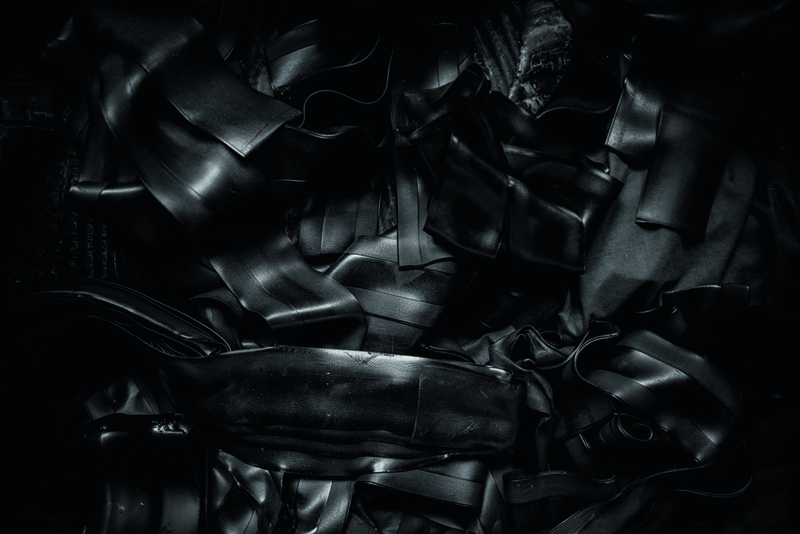 Only half a day is required to produce enough rubber for the 24,000 bike tyres that the plant produces each week — the rest of the time is devoted to making rubber for car and industrial tyres. Although the rubber compound varies depending on the model of tyre, the basic formula is the same; the constituent quantities are altered to produce tyres with different characteristics. Synthetic rubber and natural rubber are the obvious starting points — these are combined with sulphur, chemical agents, and carbon soot. Some tyres also include colouring, although Continental colours only its sidewalls, as the additives can inhibit grip. Unsurprisingly, Malcherek looks unimpressed when we ask to see the room where the rubber is mixed. A lot of time and money has been invested in perfecting Continental’s Black Chili compound, with subtly different mixtures employed for each high-end tyre, depending on its intended use. There was no chance they were letting in a group of British journalists to blow the whole operation. This is one industrial process that will remain secret. The air hangs heavy with the stench of melting rubber as we walk along the third floor of Building Number One, the long corridor where the process of turning the palettes of raw rubber compound into a fully formed tyre takes place. The northern end of the corridor is where the process begins. The first step is to shape the huge foot-thick chunks of rubber compound into a thin strip of material that will become the tread of the tyre. This is done by heating the rubber to 200ºC and forcing it through a thin mould to make it the correct width and thickness, before rapidly cooling it in water and sending it on its way through the wall and on to the next part of the process. On the other side of the walkway, another machine is busy putting together the casing — the material that forms the underside of any tyre. The rubber might get most of the attention, but this casing is vital in determining the characteristics of each tyre. Finer nylon threads make for a smoother and therefore faster tyre, indicated by a higher TPI (threads per inch) count, whereas coarse nylon threads make for a tyre that prioritises cut resistance over speed. So if you’re after a quick race tyre this summer, look for something with a TPI north of 110. At this end of the building, the ‘Handmade in Germany’ slogan that accompanies all of the tyres seems a little unjustified. The two machines that create the casing and tread require only one worker each to operate, and the amount of whirring, cutting and melting going on mean the workers are keeping their hands well away. operate individual machines, each taking the constituent parts and putting them together into something that begins to resemble a tyre. discipline, with workers layering up the tyre around a large rotating drum. The first step is to wrap the nylon casing around the drum, which is then rotated and the casing cut by the operator so the ends overlap slightly. The beads, the parts of the tyres that slot underneath the lip of the rim on clinchers, are the next parts to be put in place. These are either Kevlar or metal depending on whether the tyre is foldable or non-foldable, and have to be lined up parallel by eye. The edges of the casing are then folded inwards to envelop the beads, and create a triple layered casing. Next up is the part of the tyre that Continental is perhaps best renowned for — the puncture protection layer. Vectran is Continental’s top-of-the-range option here, and certainly seems like an impressive piece of engineering. Made from aramid, Vectran is the same material that is used in bulletproof vests — so next time Continental tells you that its tyres are bulletproof, don’t scoff. This, or one of the company’s other anti-puncture protection technologies such as Hardshell or PolyX Breaker, is then positioned on the drum along the centre of the casing before the rubber compound is placed on top. At this point, in terms of materials at least, the product is nearing completion. However, it’s still flat, looking more like a belt than a tyre; there’s one final step — vulcanisation — before the finished tyre can make its way to the packaging department. This is perhaps the most classically industrial step of the process. It’s not quite fire and brimstone, but the heat in this part of the factory must be approaching 40ºC — unpleasant at the best of times, but close to unbearable when dressed as we were for the sub-zero temperatures outside. of the tyre, ramping the pressure up from 29psi to 217psi. After three minutes (slightly longer for cyclo-cross and mountain bike tyres), one of the workers takes the lid off the press to be greeted by a blast of hot steam, and removes what could be a £50 tyre using what seems to be a short, blackened stick — an instrument that looks as though it’s put in more hours at Korbach than many of the factory’s workers. This is the end, or perhaps the start, of the road for Continental’s clincher tyres. However, it is the final step of the production of tubular tyres that really justifies the ‘Handmade in Germany’ slogan. factory is that the creation of tubular tyres requires considerable skill and concentration on the part of the workers who produce them. One of the three workers on shift, Maika, flashes a nervous smile as she is surrounded by our party to examine her work on the batch of Sonderklasse track tyres. After a few words with Malcherek, Maika’s concentration is back on the tyre in front of her. She fires up the sewing machine and within seconds has perfectly sewn the inner tube into the casing of the tyre. A small gap is left either side of the valve, and the final few stitches are completed with needle and thread. The level of skill involved is hugely impressive, and Maika is clearly proud of her careful handiwork. However, this feeling is not confined to the workers on the second floor sewing together the tubulars; it seems to be present throughout the factory. 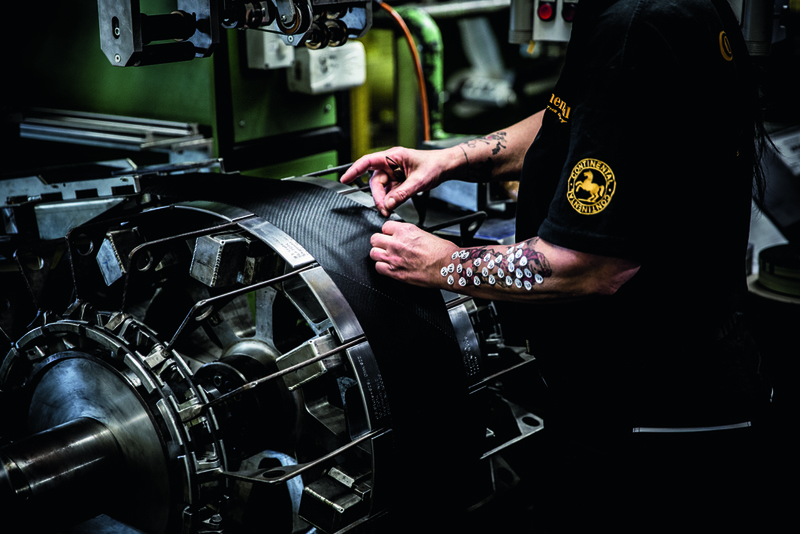 ‘Handmade in Germany’ may have begun as a piece of marketing spiel designed to sell more tyres, but for the workers at Korbach it is a statement of pride. Much more than a two-finger salute to the bike industry’s love affair with the Far East, the slogan is a reminder of the graft and skill that goes into every one of those Gatorskins and GP4000s you see out on the club run each weekend.